Recently, 55Co (t1/2 = 17.5 h) has garnered increased interest as a positron-emitting radionuclide due to its chemical properties and its high-abundance positron efficiency of 76%. Its half-life is suitable for the labeling of small molecules and peptides, allowing for PET-imaging up to 48 h post-injection if necessary. It is often compared with 64Cu (t1/2 = 12.7 h), which has a similar half-life but can suffer from reduction in vivo leading to undesired liver uptake. Similar in vivo behavior has not been observed with 55Co-labeled agents. At the UAB Cyclotron Facility, 55Co is produced via the (p,α) reaction pathway using an enriched 58Ni solid target. Currently, the Lapi group has several ongoing collaborations focused on developing different 55Co-labeled radiopharmaceuticals. One of these agents is for monitoring areas of rapid bone turnover, which has implications for the detection of osteocarcinomas. Above. 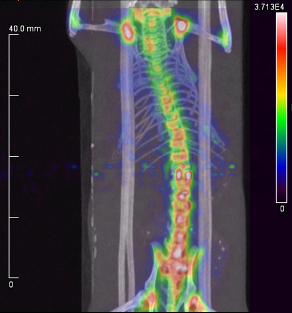 A small animal PET/CT scan of a healthy mouse 4 h after injection with a 55Co-labeled phosphonate derivative. Uptake is largely limited to areas of rapid bone turnover (i.e., joints) and does not accumulate in the kidneys or liver. The novel positron-emitting isotope, 52Mn (t1/2 = 5.6 d) offers the potential for probing longer biological processes or investigating manganese-specific applications. Currently, 52Mn is being routinely produced at UAB’s Cyclotron Facility. In addition to providing 52Mn to other research institutions, the Lapi group has several projects that focus on 52Mn production and use. One of these projects is the continual optimization of more effective and faster separation methods of radioactive Mn from Cr. This includes the development of an automated system, to reduce the absorbed dose to personnel during target processing. To further improve production of 52Mn, the cross-section of the 52Cr(p,n)52Mn reaction is being evaluated, as well as the associated 54Mn and 51Cr impurities produced when natural Cr is bombarded with protons. Because of its half-life, 52Mn is a suitable candidate for labeling molecules with relatively long biological half-lives (e.g., monoclonal antibodies or nanoparticles). Thus, new 52Mn chelation strategies are being explored that can potentially be used to create novel imaging probes. Additionally, with the recent increase of interest in PET/MRI as well as new developments in Mn contrast agents for MRI imaging, the Lapi group is studying the characterization and quantification of 52Mn by PET/MRI, which will be useful for the development of new Mn-based MRI agents. In nuclear medicine, a theranostic agent is one that has both therapeutic and diagnostic capabilities. The power of this combined approach has implications for enhancing and improving personalized medicine. Recently, increased development of receptor-targeted radiotherapies has highlighted the need for reliable predictions of the pharmacokinetic profiles of these agents. One of the best ways to do this is by imaging with a chemically identical, diagnostic counterpart. Therefore, the development of matched radionuclide pairs is a rapidly expanding area of research. One promising matched pair with theranostic potential is positron-emitting 44Sc (PET-imaging agent) and beta-emitting 47Sc (therapeutic agent). 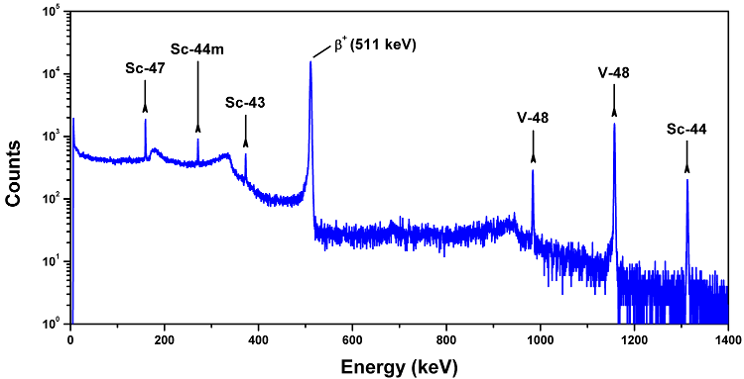 In the Lapi group, production of 44Sc (t1/2 = 4.0 h) and 47Sc (t1/2 = 3.3 d) is being investigated using natural Ti targets via the 47Ti(p,α)44Sc and 50Ti(p,α)47Sc reactions. Initial work has focused on method development for the chemical separation of radioactive Sc from Ti. Future work will focus on targetry and recycling chemistry using enriched 47Ti and 50Ti. Several 44/47Sc-labeled agents are being developed. Above. A gamma-ray spectrum showing peaks attributed to several Sc radioisotopes and 48V, which were produced during a routine bombardment of a natural Ti target with 24 MeV protons. Perfluorinated alkyl substances (PFASs) are a family of compounds made up of polyfluorinated, carbon chain backbones with varying functional groups such as carboxylic acids, sulfonates and sulfonamines. They are used in a variety of manufacturing processes and are found in many different consumer products (e.g., non-stick cookware, flame-retardants, carpet, upholstery and fast food wrappers). These compounds have been associated with various health hazards and there is a great need to accurately assess where these compounds accumulate in the body. Unfortunately, PFASs are not easily detectable using UV spectroscopy, and so most techniques for assessing bioaccumulation are highly involved, labor intensive, and oftentimes provide contradictory results. This made the opportunity to radiolabel PFASs very exciting. The Lapi group was interested in developing a procedure to efficiently radiolabel varying chain lengths (C4 - C8) of perfluorinated carboxylic acids with 18F (t1/2 = 109.8 min), providing a simple and straightforward way to quantitatively analyze these substances in vivo. After radiolabeling and purification, three PFASs ([18F]PFBA, [18F]PFHxA, and [18F]PFOA) were evaluated for their stability in various sera as well as their behavior in mice. Interestingly, each [18F]PFAS compound showed differing affinities for mouse, human, and rat sera, and all of the compounds displayed different biodistribution profiles within the tissues of healthy mice. To read more about these results please see our recent paper. Efforts are currently underway to create more [18F]PFAS compounds that will mimic commonly found PFASs in order to evaluate their biological behavior. Furthermore, the [18F]PFASs are being used as a way to assess more traditional purification methods.